Recently I have received a lot of emails/DMs asking about practice plan structure. I wanted to write a post breaking down how I break up our practice by scheme as well as by time. This is what I refer to as an install practice schedule. We are essentially in install (or learning) mode from Spring Ball all the way until the week of our first game. We do not have a specific game plan to get ready for or an opponent… we are working on OURSELVES and getting better at our base offense May – early August. I have written about the 2 DAY INSTALL and 3 DAY INSTALL in the past… I enjoy using both and either one should work well for you. Having a 2 or 3 day install is important because it sets the rough framework for our practice plan. Once we understand we are cutting up the offense into pieces it becomes easier to plan out our days. I will start with the run game. We have a ZONE DAY (Inside and Outside Zone) and a GAP DAY (Power and Counter). This helps to frame my INDY time with the OL, the inside Run script, and the run plays I call in team. We get Practice done in under an hour on each side of the ball. I believe in practice having a routine so we generally start with indy, progress to group, and finish with team. Like most teams are doing, practice is broken up into 5 minute segments. I use GOOGLE SHEETS for all practice plans because it allows me to copy practice plans for future days, and most importantly it allows all of our coaches access to edit the practice plan in our own time. The template looks like this (save yourself time and use formulas to auto populate the time cells… so you only have to edit the start time and ALL the times auto update). I leave room at the top to write down the specific concepts we will work that day. We begin practice in INDY. The OL/TE/FBs always start with run game indy first. We get 20 minutes. On DAY A (ZONE day) we will work base blocks, doubles, and reach blocks. I can tweak this time as necessary. Some days i give the Doubles 10 minutes, some days I give the REACH blocks 10 minutes, whatever I feel we need more work on. While we are doing that the skill guys have INDY. We typically start the QBs/RBs together for mesh. Early on they get 10 minutes a day. As we progress that goes down to 5 minutes. The WRs start with INDY. From there the RBs do INDY work and we either do mroe indy work at QB and WR or they group up to begin throwing individual routes. The next part of practice is in small groups. The OL and Hybrids do inside run, while the QB/WRs work on our key screen/RPO game. After that we enter passing phase of our plan. The OL works pass pro drills. The TE/FBs go with the QB/WRs and begin learning/refining our pass concepts. As we progress this can transition into 7on7. The RBs will either continue to work INDY or if we plan to use them in the specific pass concept they will work with the other Skill guys. I usually bring them back with the OL to work blitz pick up before doing a brief up tempo team period. During this install phase you can see I don’t believe in working a lot of TEAM time because I feel the real learning and progress are developed in your INDY and Small Group time. When we get into GAMEPLAN mode we work much more team time than this because we have specific expected defenses and plays we like. The next day would be DAY B (GAP DAY) and would follow the exact same format. All that would change are the pass concepts repped, and the OL INDY work would be Power/Counter specific. For example in INDY we would work DOWN blocks, Gap Doubles, and Pulling. Again here I have 4 time blocks, to work through 3 base drills. This means I can double up and get 10 minutes on one of those drills per day. Some days it is DOWN, some days it is Doubles, some days it is pulling… whatever I feel we need more work on. Here is the link to this TEMPLATE. Posted in CoachBDud Material, Offense. I have been a big proponent of the “3 day install” for the last few years and have written about it HERE. However this year I wanted to try something new… the 3 day install is great but it just never seemed to “fit in” with our weekly schedule and our concepts. ALL of these things do not divide by 3 well, but they do divide by 2. Prior to Spring Ball starting I was mapping our install out and realized it all made more sense by fitting it in to a 2 day install plan. I would then get to work that 2 day plan, TWICE during each week. Dividing the plays out was simple…Day A and Day B. Day A would be a ZONE day for the OL/run game… we work Inside Zone, Outside zone, 2 quicks, and 2 drop backs. Day B would be a GAP scheme day for the OL/run game… we work Power, Counter, the other 2 quicks, and the other 2 drop backs. We just keep repeating these 2 days. Day A and Day B narrow the focus of what we will work on, and through each round of the install plan we will ADD wrinkles. The wrinkles can be anything you want… personnel groups, formations, motions, screens etc. The core concepts remained the same and we add on to the complexity each “round” by sprinkling in some new learning. At the end of 10 spring ball days we have worked each concept 5 different days. Where this really helps me is in practice planning. I have OCD when it comes to prepping my OL work. What we do in INDY is directly related to what we will run in INSIDE RUN, which is exactly what I have scripted for team. We aren’t working pulling on a zone day, or reach blocks on a gap scheme day. The QB/WR/RB groups are planned out with the same idea. I spent yesterday, like most football diehards, watching the 2 College Football Playoff games. In each game I noticed a package play… a RB swing screen to the wide side of the field, packaged with a QB GT Counter to the short side of the field. Below I will breakdown how Alabama and Oklahoma each ran this play for explosive first downs. The design of the play is to have 3 lead blockers on the perimeter for your RB swing to block the Corner, Sam LB, and Safety. Bama ran there’s from a 20 personnel set with my favorite RB in the world Najee Harris, and Josh Jacobs in the backfield. Oklahoma ran theres from a spread trips formation. The perimeter players block the screen, and the OL blocks the counter for the QB. The QB reads the Swing side DE… if he squeezes/chases the pulling tackle throw the swing. If he attacks the RB, tuck it and run following the pullers. The backfield action attacking out wide, with the OL blocking counter the other way really stresses the defense and truly cuts them in half. The box players have to respect the counter, the perimeter players have to respect the Swing screen. In the Bama clip they’re able to hit the RB swing for an explosive 22 yard play. In the Oklahoma Clip Baker Mayfield keeps the ball and runs for an explosive 22 yard run. 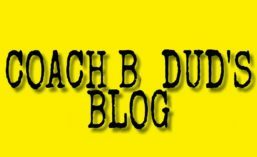 Posted in CoachBDud Material, College Film, Offense, Run Game, Screen Game. As Monday’s National Championship game draws near, I decided to break down the offense of what has become one of my favorite teams… Alabama. Yes Kiffin is out and Sark is in, but I do not expect a ton to change offensively. Coach Sark has been on staff all year and as an analyst I’m sure has had his hand in the game planning process each week. The offense had some struggles in their playoff game against Washington but I wanted to take a look at the plays that worked well for them against UW and what I think they will use against Clemson in the National Championship. Below I took a look at several concepts that worked last week and that THEY NEED to work well Monday in order to win. UW did a great job defending the QB sweeps that Bama runs, but Freshman QB Jalen Hurts was much more successful running the ball on some of their read based QB runs. RB attacks wide, the DE is left unblocked and the QB reads him. Bama runs several End read schemes. They will threaten him with a toss or a sweep path by RB (both with power blocking for the OL). Look for the Toss Read and the Power Read to be key concepts for BOTH offenses in the Natty. 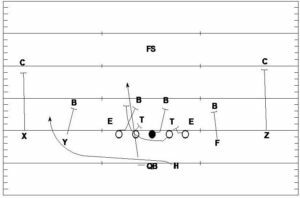 Another play Bama uses is the inverted veer or “Bash” concept as some call it. The OL will block Inside Zone (IZ) leaving the backside DE unblocked. The Rb runs a wide sweep path toward the DE as the QB shuffles reading him. If the DE squeezes he gives the ball to the RB around the edge. If the DE widens with the Rb, the Qb keeps the ball and runs inside. 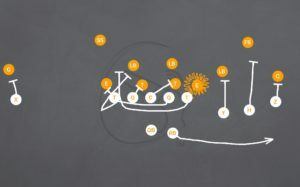 Bama will often use an H back to “slice” across the formation and block the backside DE. One wrinkle off of this is the “BLUFF” tag. The H back will now bypass the DE, running around him to block the force player. This gets the QB an extra blocker outside if the DE crashes and he pulls the ball on the zone read. I think Coach Sark is going to POUND THE BALL. Bama can do this in many ways but one particular way to look out for is via the bunch formation. Bama had several successful runs against UW running a zone dive toward a Bunch Set. OL looks to be using Zone principles to the right. In the Bunch the WR blocks the corner and the TE looks to base the defender over him. As the H back zones right with the Left Tackle (looking to climb if DE pinches inside big Cam Robinson) this creates a natural crease between the LT and the bunched TE. With the rest of the OL zone blocking, it gives the back options to run to daylight. While I believe Coach Sark will pound the ball with Hurts and the stable of backs, they will need Hurts to step up and make some plays with his arm to win back to back titles. OJ Howard had his coming out party against Clemson in last year’s Natty catching 5 passes for 208 yards and 2 TDs. He will be a valuable play action weapon for Hurts in this game. One way Bama has gotten hurts the ball is running him on wheels/vertical routes to the boundary. The play starts off looking like Power Read. Howard is a great blocker on the perimeter so the defense has to respect the run look. As the WR releases inside and gets vertical, it clears out space for Howard to settle in the hole. Another concept I look for Bama to use is the Sprint Out Pass. With an athletic, young QB like Hurts one of the easiest ways to get a completion is to sprint him out to his right. It cuts the field in half for him, he is moving toward his target and in some ways a sprint out simplifies things for him. He can roll out, read 1 defender and fire the ball in there. Sprinting him out also puts stress on the defense to keep him contained because his legs are still his most dangerous weapon and he can take off if everyone is covered. Here are 2 Sprint Outs Bama hit vs UW. The second one got called back as a Bama WR covered up his teammate, but look for Bama to use the Sprint out against Clemson. I look forward to the National Championship because they gave us such a great game last year. Both teams are full of NFL talent. I look forward to seeing how Coach Sark runs the offense and I am sure we will see these concepts in the game Monday Night. Posted in College Film, Offense. The Power Read Concept took the football world by storm a few years ago. The new version of this play is to Toss the RB the ball rather than sweep mesh, to get him outside faster. I first saw the play last year from a High School Coach and then saw several college use it during the 2015 Bowl Season. I wrote about North Carolina using it last year here. The idea is simple… OL blocks Power playside. The Rb aligns playside and runs a toss. The Qb catches the snap, shuffles towards the back, reading the DE. If the DE squeezes or attacks him, toss the ball to the RB now. If the DE widens to play the RB, keep the ball and run inside. This is a great way to get the ball on the edge against talented DEs. It is difficult to reach a great DE to get the RB the edge, but by blocking down with the OT and getting the DE to squeeze that, you can toss it outside and use what he is taught to do against him. This play became a big part of the Clemson offense in 2016 and they really hurt Ohio State in their playoff game with the QB Counter off of that action. Deshaun Watson killed Ohio State in this game with the GH Counter (Guard and H back ) off of toss action. The next play to look at in this series is play action pass. Now I will be honest, this play is somewhere in between quick toss and QB power in terms of run action… The Rb path is definitely more vertical than on the toss but it is similar enough that I included it here. Although incomplete, this is another way to stress the defense. RB attacks wide outside of the OT and gets vertical down the middle of the field. A more accurate pass away from the safety and this is a 1st down completion. Clemson is known for combining their Jet and Toss into one play. I do not know if the play is called or read but here are 2 ways they did it in the game. The first from under center with an unbalanced Jet look, with quick toss going opposite. This other look was not as successful but you will see them going Jet one way, with quick toss the other. The OL blocks power toward the toss, away form the Jet. Posted in College Film, Offense, Run Game, Spread. I have been watching a good amount of Pitt’s 2016 film lately. They did several interesting things under OC Matt Canada (who just got the LSU OC job). To me, the most interesting thing they do is the way they package Jet Sweep with their Inside Zone (IZ) run game. It is unique to me in that they are executed the EXACT same. Pitt runs the Jet going one direction, with the IZ going the other way. From looking at several clips of this it appears that Part of the team is blocking IZ, while others are blocking for the Jet. For example, imagine Jet going Right, with IZ (and the Rb) going left. Everyone from the RT position over toward the left, will be blocking IZ Left. Everyone from the Right TE position and/or H back Position will be blocking for the Jet . Notice I said “position” to describe each spot. That is because Pitt does a lot of unbalanced formations, and often a tackle will be over next to the other tackle, and end up as the 3rd man to that side, or “the TE position”. His follows the rules as if he was a TE. Below are some diagrams to describe what I am talking about. The beauty of doing it this way, gives the defense NOTHING they can key on and read to get all of their hats to the football. There is nothing tipping the offense’s hand. Box players have to play/respect the IZ. DBs/Force players have to respect the Jet. DE’s get caught in between, seeing TE/H Backs run one way and OL go the other way, unsure of who has the ball, and still having some responsibility for QB boot if the Jet and IZ were both faked. Below I will go through some clips of this concept. You will see it really divides the defense as players have to honor their responsibilities and it isolates defenders, forcing them to try to make open field tackles. My favorite thing about this play series, is that it completely cuts the defense in half. In the 3 clips above you see defenders being fooled by where the ball is and it reduces the ability of the defense to pursue the ball. I think it also makes the Jet Sweep a more viable option than just “hope it gets the edge”. Because the LBs have to honor the Inside Zone action, it removes them from being inside out flow players on the Jet. Even if the defense is able to force the Jet to cut it up, there aren’t LBs sitting there to blow it up… they are trying to tackle the RB on the other side of the field. Great concept from Pitt, and I look forward to seeing LSU run it next season. I am curious to see the challenge it presents to those NFL SEC defenses. Posted in College Film, Offense, Run Game. Each year in Spring Ball or the earliest part of Summer, High School’s across the country begin installing their base offense. More and more teams are beginning to use the “3 day install”. This is a popular way that many colleges (and now High Schools) go about installing their offense. They break the offense apart into 3 total days. I first read about the 3 day install from a Smart Football post by Chris Brown here back in 2011. I have used a rough version of this since then but this year was by far my most organized/OCD spring to date. The basic idea is to put it all in 3 days, and keep repeating that 3 day rotation. Now I will discuss how I broke everything down for my days, how I installed, and how I have continued to use this progression into the Summer. The Science behind 3 day install. Some people might think you are better off mastering one basic skill, or base play before moving on to add more. This is an “old school” way of thought that is often referred to as blocking… this would be AAA, BBB, CCC learning. The same skill concept 3 days in a row, before moving on to something new. On the Surface this makes sense but modern educational research studies have shown that interleaving, “mixing it up” or ABC, ABC, ABC learning (rotating the skills/concepts being taught) is the most effective for skill and concept mastery. This is applicable to education, learning musical instruments, and sports. A more detailed article explaining this study can be found here. Now that we understand why mixing it up works best, we can begin to apply it to an offense. 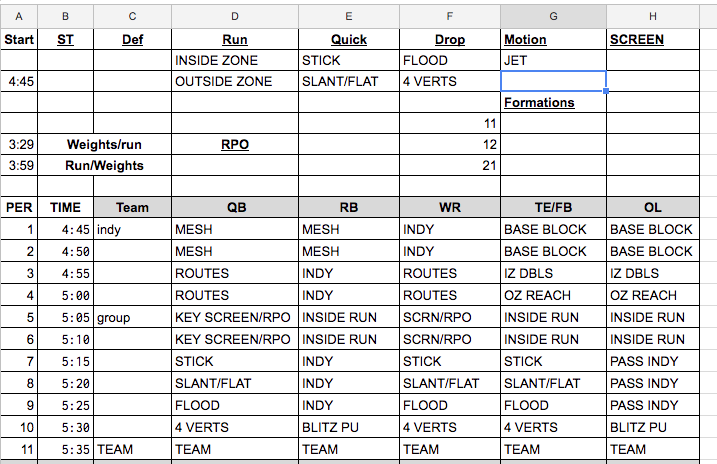 The first thing I did was to make a spread sheet with every single personnel group, formation, motion, and play I wanted to install during Spring. I had an ambitious install plan for the Spring in which we would install over 90% of the entire possible offense. After the 3 day rotation we have the potential for 6 runs, 6 quick concepts, 6 drop concepts, and 3 “other” concepts. If you do not want to install that many plays… then “double up” on certain plays. We did this with the quick and dropback game. Each play actually got included 2x during the 3 days. This is our Gap Scheme Day. We work power and counter, as well as play action off of that. We picked passes from the menu I created. This is our Zone Scheme Day. We work Inside and Outside Zone. We work screen game off those actions and I picked passes from the menu I created. This is our “other” run game day. We work buck sweep and toss on this day. We rotate the passes again. We started by teaching all of our 21 and 11 personnel formations during the first 3 days of practice. Moving on to the 2nd time through our rotation… days 4, 5, and 6 we began adding more personnel/formations. We added our split back, 12, 10 and 30 personnel groups/formations. 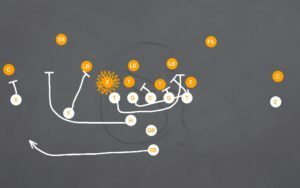 The order of the plays we worked stayed the same… The formations became the new learning. Moving on to the 3rd time through our rotation… days 7, 8, and 9 we began adding in motion. With our personnel and formations installed, the various motions became the new learning and how the motions related to the concepts. I love this 3 day rotation because it makes scheduling practice… both the drills, and the scripts much easier to manage. By splitting the offense up like this it narrows the focus down for each day… both in terms of Indy reps, and group/team reps. I am an Offensive Line Enthusiast! We have more skill development work to do than any other position. I can not come close to working all of the various blocks we need in our tool box in a single day. By splitting up the schemes, it lets me break down the Indy time to work on exactly what they need to do that day. To put it in perspective… let’s look at just the run game. On a gap scheme day (A) we work down blocks, gap doubles, and our pulls. On a zone day (B) we work base blocks, combo blocks, and reach blocks. On our “Other day” (C) we work different skills, fast reaches, Fb Logs, and perimeter pulls. By narrowing the focus of what we will run during inside run and team that day, I can narrow what I need to work on during Indy. It makes my time scripting plays for run, pass, and team periods much easier as well. I do not have every play to choose from. I have no more than 2 from each category to choose from, this lets me get multiple reps of the plays in, from different personnel groups or formations. This also makes my practice planning much easier, and take up less time. I don’t create a new practice plan each day. There’s a practice plan and script for A, B, and C. I can copy and paste these (using google drive for both) and make any small changes I need for that individual day. I am never starting from scratch. Having the schedule and script for A, B, C stay mostly the same lets me knock out any small changes or additions in less than 10 minutes, then I am printing it out and ready to roll for practice. Now that we have moved into Summer I have kept the same basic rotation but I will be tweaking it in one small way. We practice 4x a week. Monday – Thursday all Summer long. So far I have stuck with the exact rotation (adding small wrinkles here and there, but the core is the same). What I will begin doing from Mid July on, is to “test” my players more. Currently practices are focused on INDY and small group time with very little “team” going on. I will begin starting the ABC rotation every Monday, and rather than restart on Thursday… I will use Thursday as a “review of ALL concepts” day. I will use more team and group sessions, mix all of our schemes, and use this to really test how well things have sunk in with my kids. This will be my assessment not just of how well they are learning, but more importantly how well I am teaching. This will act just like a test in the classroom, and let me know what I need to spend more time working on on the white board, and on the field. Once We begin school and move into the season I will have to get off my this Spring/Summer rotation because we are more limited in the days/time we have to practice. I won’t be able to give each group of plays it’s own day, and practices will be about the game plan and match ups. In season the focus shifts more to the opponent, but now… in the Spring/Summer portion of the off season, their is no opponent, it is all about learning for yourself and this system of installing an offense has been the most productive I have ever used or seen. We were running plays better after 10 days of spring ball this year, than we were to start the season in 2015. Posted in CoachBDud Material, game planning, Off Season, Offense.